Tweety Tunes is always seeking new and undiscoved talented individuals to work with us. If you are interested in sharing and showcasing your song writing or recording talents, let us know. After reviewing your materials, we will get back to you. Be sure to include the best method for contact. 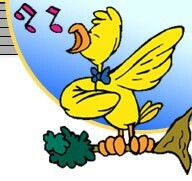 All materials submitted to Tweety Tunes become the property of Tweety Tunes and may be used for future considerations. Sorry, but we will not return demo materials.